You have to pay for overdue and services as follows. 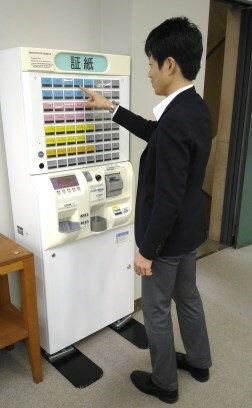 In case you pay, please buy "Shoshi" at ticket vending machine and submit it to the Document Supply Center during office hour (please refer to [Detailed Service Hours] in [OFFICE HOURS / CALENDAR]menu on the Library website.) The ticket vending machine is located on the first floor of the Main Library(Ticket vending machine is also located on the second floor of administration building ). Please check Library Friends for details.